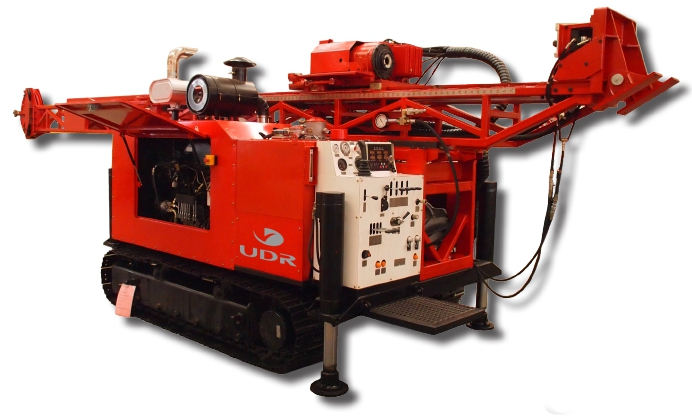 The UDR range of exploration core drilling rigs consists of five different models,with N size drilling capacity ranging from 400 m to 2300 m in depth. The Crawler Mounted UDR1600D has been designed specifically for diamond coring in medium to deep drillingsurface exploration applications where site access limits the use of larger drills.The UDR1600D’s compact designcombined with it’s self propelled crawler track drive system makes it an ideal choice for drilling operations in jungle or hilly terrain where the use of heavy trucks is difficult. European grade hydraulics have been utilised for optimum efficiency,this combined with it’s heavy duty mast,sub structure and high output diesel power pack ensures outstanding drilling performance and reliability. Safety is recognised as a key priority at UDR,our standard offering includes purpose designed rod safety spin guards,drillers’ and offsiders’ work platforms. The UDR900D can easily be transported in 40ft sea containers.